Having a desperate fear of neck pain is a normal reaction for patients who have serious, chronic or recurrent symptoms. In fact, the last group of patients who have unpredictable recurring bouts of symptoms are usually those who are also the most fearful of their pain. Fear is a part of life and is certainly an understandable emotional reaction to many matters of health and suffering. Some patients fear for their future, some fear for their functionality, while others fear the pain itself. As a long time sufferer of various types of dorsalgia, I can certainly understand and empathize with your fear and can tell you quite a bit about how fear can worsen and perpetuate pain. This essay examines the role played by fear in chronic pain sufferers. When patients seek diagnosis for any painful condition, they always have a degree of fear built up over the unknown. However, most hope that there will be no serious issue found and that their doctor will tell them that all will be well in a short time. However, once diagnosed with virtually any significant structural issue, fear will grow. This effect is called nocebo and is a direct cause and contributor to symptomatic escalation and/or perpetuation in many patients. The power of the nocebo effect has been studied in many medical applications, but is particularly demonstrated in back and neck pain sufferers who receive a diagnostic conclusion indicating a significant spinal issue, such as a herniated disc. Fear is known to increase the severity and intensity of pain, as well as assisting it to last far longer than it normally would if the patient was reassured. It is normal to experience fear when you have pain. It is also normal to suffer a nocebo effect from almost any serious diagnosis. The best way to deal with this fear is to understand and accept it as an inherent part of being human. We all fear what we do not understand and we all fear those things which can hurt us, physically or emotionally. In the case of chronic neck pain, there are both anatomical and psychological effects, so fear is justified. Once you can admit the fear to yourself, then it is time to share it with others. Do not be afraid to tell your doctor of your feelings and those who love you, as well. Talking about your worry and anxiety is a great way to demystify it and remove control from its hands. Additionally, by openly discussing fear, you are sure to increase your understanding of the actual condition causing your pain. Knowledge is a great help in overcoming any controlling emotion. In fact, the more you can learn about your diagnosis, the better you are likely to feel, even if the news is not all good. At least there will be far less uncertainty, which will help reduce the overall effects of fear. Fear is just about as bad as pain in many instances. I can share with you my own back pain fear experiences and hope that you will take the time and effort to share yours, as well. You can always write them down on our social media pages. Many patients find this to provide great emotional relief. I had immediate fear at the age of 16 when I was first diagnosed with degenerative disc disease and scoliosis. My first chiropractor did everything possible to actually ensure this fearful response, since he turned out to be a financially-motivated charlatan who loved to frighten patients into ongoing and unneeded treatment, but I digress. I was also incredibly scared when I discovered that I had 2 herniated discs in my early 20s. The worst fear I ever had came after 2 bouts of particularly acute pain which occurred about 4 years apart in my later 20s. After these episodes, I was truly frightened for my very life. 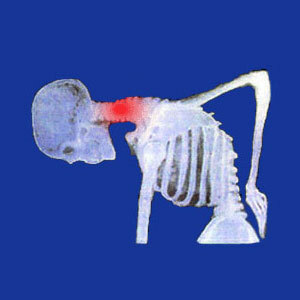 Fear of neck pain can fade with time and concerted effort to be free from it. I worked diligently at this process and have basically overcome the anxiety and worry of my former self to a large degree. My pain has worsened over the years, but it does not affect me emotionally nearly as much. By the time I discovered that I actually had 12 herniated discs, a possible spinal syrinx and various other serious spinal issues, I was prepared and took it in stride. I can not change my spine, but I can change the way the diagnoses affect me. I hope that this article inspires you to think carefully about how fear can increase the effects of your pain exponentially. I discuss the effects of fear on health in my critically-praised book The Power of Fear. This book is just one of a collection of books in our proprietary and award-winning Cure Back Pain Forever Program.